Into the Gloss. Trendy. Basic (not an insult!). Like old lipsticks, and that’s not an insult. It’s the naturally-occurring fragrance, none has been added to the formula. Apply to either dry or damp skin, your preference, massage in, flannel off. You can remove it by splashing off if you prefer, as demo’d in their videos, but I prefer a flannel. Second or AM. Although it does remove makeup in the demo, I found I had to scrub a little too hard and the effect afterwards was a tad dry. It’s great as a morning cleanse. Summer or second cleanse in the winter, but not on really dry skins. I’ve had it for three weeks. $18.00 for 6 fl oz/177ml. It’s a good size, should last a good couple of months. Anything. No special treatment needed when using it. Good. All the basic information, ingredients listed, and demo videos. For those of you unaware, Glossier is a brand sprung from the hugely successful beauty website Into The Gloss. It’s a masterpiece of marketing, and manages to somehow sell Glossier sweatshirts logo’d up like the GAP and three pink plastic jiffy envelopes for $12, alongside the newer skincare and makeup lines. It’s only available in the US, so knowing I was headed to NY recently, I asked a girlfriend of mine to order everything in for me, and it was waiting for me on arrival. I also got my hands on Milk amongst other things, so more reviews will be coming. 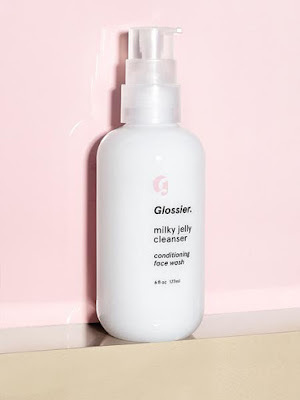 Only available through their website, glossier.com. Coming to the UK in the second half of 2017. This is a nice formula that definitely cleans the skin, but I wouldn’t use it for makeup removal. In my personal use, I found I was instinctively avoiding it if my skin felt dry/dehydrated. It’s nice for a morning cleanse, and fine as a second cleanse after a good oily balm. It’s nicely ph-balanced, not too alkaline, not too stripping. It feels good when using it and is very comfortable on the skin. I love the packaging, it does the job and isn’t faffy. If you want the money in your formula and not your packaging, you’ll like this entire range. They’ve managed to make some of the most generic, low-priced packaging available look aspirational. Clever work. If your skin is on the dry side, I don’t think you’ll find this nourishing enough. It’s very ‘American’ in its formulation, i.e. designed as a gel, no whisper of oil content, the preference for splashing off and no mention of a face cloth/flannel. If you have good skin, you’ll like it. If you have oilier skin, you’ll like it. If you’re really dry or eczema-prone, it may be a tad drying.